Tues 18th July - There had to be the ubiquitous flag-off albeit a ceremonial one. Michael Sawing did the honour against the backdrop of the early morning mist. The team with Michael Sawing, the chief honcho of the Kapit Division and Mathew Ading, Manager of the Regency Pelagus Resort prior to the first stage of the tour. 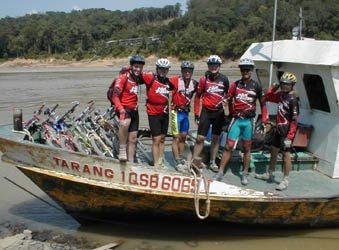 Thereafter, the team was ferried to Camp Ecobay, about 10 minutes away, but not before going through the dreaded ritual of embarkation and disembarkation with all the luggage in tow. At least it provided some degree of warming up. Report from the camp manager that the logging road was choc-a- block full of inch thick dust got us to bring out our bandana to prepare for the inevitable. But we were all raring to go. Bad move! Wham!........the hills hit you almost immediately before your internal combustion engine could fire smoothly. Trust Glenn to use his clipless pedal for the first time. And his heart and spirit did not seem to be on working terms that morning. Push he had to, up those 15-18% gradient hills. Practically everyone's heart rate were off the lactate threshold limit. But Malcolm seemed to lap up the climbs like a 6-year old would on his ice-cream stick. If he were feeling the pinch, he was not showing it. The 3-km first course of the day to the junction of the main logging road seemed hard to swallow. The sun gave a bit of respite but came back with a vengeance for the rest of the day. It was now mid-morning and our camelback was working overtime. We were riding along a very busy section of the stage. The heavy traffic of logging and and coal mining trucks, combined with the drought in the region, we soon understood what the camp manager had earlier warned us about. Dust and dust storm! Imagine hundreds of thousand of talcum powder canisters being being emptied of its content along this stretch of the road - all 27 km of it. One wrong squeeze of the front brake and you would get a washout (Fui would say, ' Ouch') and the dust storm whipped up by the trucks blinded the riders. It was an amazing sight to see those coal mine trucks tackle the hills under the hostile condition. First, you hear the roar of the 10,000 cc turbo-charged engine as it crawled its way to the crest of the hill and then an even louder roar as the driver gunned the 18-wheeler down the slope as if he were late for an appointment. During one of these performances, we happened to have a front on view of two trucks screaming down the slope. The trailer end would bob up and down, flex sideways as the driver fought the wheels to keep the juggernauts true on course. He had to! We were all too vulnerable! All dusted up while fixing a puncture. Note the colour of the road. 30 km may seem short by any standard. But throw in the heat, dust and long climbs, the morning seemed long. In fact when noon came, we could still see volumes of dust rising in the distance, which indicated to us that base camp was nowhere near. Water was running low and food was kong piah and an apple each. In fact some of us had to share our water. Oh, the thought of a cold can of Coca-Cola tickling our throat started to dance in our head. We had to get to Camp Tulle eventually and got there we did. 'Water!, water! ', our body cried out even before we got off our saddle. It was unbearably hot - hot enough to adequately dry our jersey, gloves, shoes and socks in the 1 1/2 hour lunch stopover there. Lunch was noodles and eggs and flashbacks of the ride so far - 2 tyre punctures, fast and tricky descent, long granny climbs, dust storm, a hairline fracture just below the brake hanger on Fui's Judy XC, abrasions and bruises and stunt performance by the truckies. The smiles were before the disembarkation ritual..........at Aman log pond. The embarkation and disembarkation ritual again! I guessed we were all resigned to the fact by then. The transfer from Camp Tulle to Aman log pond 5 minutes away on the opposite bank of the river had to be done. And Glenn had to cause a little diversion as boat QSB 6069 had to turn around for him to fish his hat out of the river. Another 10-km to go and we were soon joined by a group of local mountain biking enthusiasts. The ride was a breeze until the local mountain bikers decided to test how good we were. Ah...contrary to their early publicly stated intention of joining the team for a group ride, it turned out to be an impromptu race into Kapit. Daron, Liu and Malcolm were ready for them, however. Being less race smart, they fell for the decoy in Daron who tried to wear them out by attacking as soon as their intention were known. Meanwhile, Malcolm and Liu knew that they would have the reserve for the final stretch which included a hill climb. By the time the riders reached the hill, the local riders were a spent force including Daron naturally. And Malcolm and Liu ate them for tea! 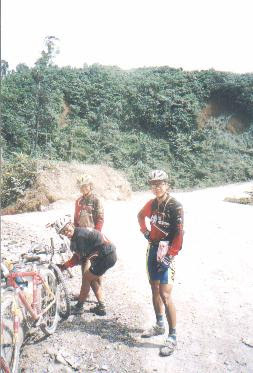 Michael, Eunice and Fui decided to have their tea at the 4.00pm reception while Glenn probably couldn't wait to have his when he inexplicably rode into Kapit alone ahead of his teammates who were timing their entry into the town for the start of the official group ride.